TOTO has changed the perception of what a bathroom can be — and how it can be used. The Chambord collection is a harmonious blend of luxury materials and authentic French expertise. A rich, historical heritage shines through the products, so when you choose Chambord, you are choosing to imbue your kitchen with the wealth of our history and a touch of the truly exceptional. The Kallista story begins with two European visionaries who had the idea to break white-and-chrome convention by offering plumbing products of superior design, style and functionality. 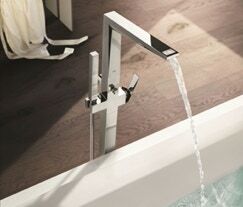 Dornbracht represents the very highest quality of manufacturing, progressive production and innovative design. The premium fittings of this family-run company have won numerous international awards, acting as a driving force for the developments and trends of an entire industry. DXV by American Standard, a flagship portfolio of luxury bath and kitchen products that celebrates the company’s distinguished 140-plus-year heritage by re-imagining the most influential design movements during that time. ROHL Collection, brings authentic luxury to the kitchen and bath. Every faucet, fixture, and accessory is designed by Working closely with acclaimed artisans and architects throughout the world ROHL curates an impressive portfolio of kitchen and bathroom products with indisputable provenance and quality. Bermudians first choice for distinctive style, array of choices, and uncompromising performance. 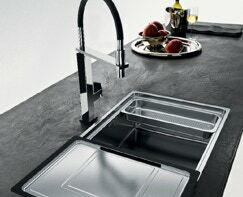 Franke's integrated systems bring style, convenience and craft into your kitchen. 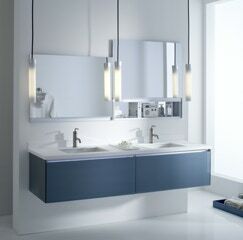 Premium kitchen faucets and bath faucets, showers and shower systems. To that end, Brizo designs and crafts high-end collections for the kitchen, bath and shower that prove form and function, in the right hands, can be one and beautifully the same.